I was fortunate enough to attend a military promotion ceremony recently. It was so inspiring to hear not only what the person has accomplished, but to witness the reaction among his peers. To me, military traditions elicit patriotism and I feel honored to have had the privilege of participating in one. 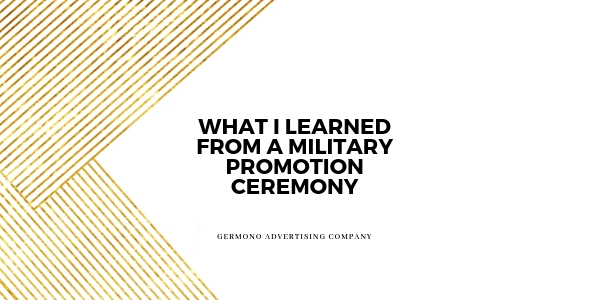 The traditions of the military are there for a reason and while they may sometimes experience backlash, this ceremony was one that made me even more proud to be affiliated with the military. The honoree was celebrated for his 22 years of service, which included 6 years as an enlisted infantryman in the Army, which I thought was quite nice because he’s now in the Air Force. In his speech, he talked a lot about what he learned then and how that’s prepared him to be an officer and a strong leader now. He admitted he’s not perfect and although being promoted to Lieutenant Colonel, has much more to learn. I thought about what we experience as an employee, customer, and client and how that tends to mold us into the manager or business owner that we become. Can you have respect for a manager or a business owner without that person experiencing what it’s like to be in the trenches? Personally, I don’t think so. I think we relate quicker to people who we know have struggled thru the same things we have. I know this person quite well, and had no idea of his accomplishments because he never boasts, brags or lets his successes define him. We’re different that way, as I have a tendency to float up high when on the accomplished balloon until someone pops it; however, he could flip burgers and still show humility, peace, and kindness towards those around him. I never knew that at one point, he was 1 out if 6 people in the entire Air Force who had a special experience identifier and no one else in the room knew it either. He redefined key positions for international health for training, deployable units, and postured them across the Air Force. These are still being used in international health today. This is a major difference between traits of various leaders. Some of them will constantly remind you of all of their accomplishments. Others, well, you only find out during fancy ceremonies. This person has served as a mentor, role model and dear friend to me. I looked around the room and saw people look at him with such great respect, especially as he thanked those same people who report to him for the roles they’ve played in his success. He said, “without you, we are not leaders.” He said it with such compassion, not just bs…and there was not a dry eye in the room because everyone knew he meant what he said and was being sincere. I thank my clients for doing business with me as a direct result from gleaning from his guidance and mentorship. Do we do that enough as leaders and business owners? I don’t think so. I think we are so used to taking it for granted that someone is going to continue business with us. But the competitive environment is even more aggressive and you can be easily replaced. While no rookie to working for or with others to accomplish tasks, it is new for me to hire and be a leader to someone as an entrepreneur. One day, I hope I know what it feels like to be him- to know how he feels by being respected for his actions, not initials after his name. I want those that I’ve helped to know that they have also helped me in return.